A member of the Rose family, the Fragaria genus has more than 20 species commonly known as strawberries. The modern strawberry, Fragaria x ananassa, is a hybrid of Fragaria virginiana, native to North America, and Fragaria chiloensis, native to the Pacific coasts of North and South America. European species were the original large fruited strawberry sold in markets and some are still grown for local consumption. Strawberries fall into three categories. 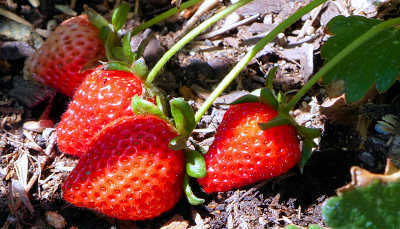 June-bearing, which produce March into May in hot climates, have the largest berries and produce one crop at one time. The harvest date varies by 14 days according to cultivar, ranging from 'early-bearing' to 'mid-season' to 'late-bearing'. June-bearing tend to produce the largest total crop by weight and are the commercial crop of choice. Ever-bearing cultivars produce two crops, one in spring and one in fall. Some cultivars seem to be a cross between ever-bearing and day-neutral and have the best characteristics of both. Day-neutral cultivars have the smallest berries and produce steadily throughout the fruiting season, but produce less total fruit than June-bearing. The best reason to grow your own strawberries is that home grown strawberries taste far better than those in grocery stores. If there were a "Seven Wonders of the Food World" list, home grown strawberries, picked when fully ripe, would be one of them. Most strawberry roots grow no more than 6" deep and do not exceed 12" deep. Root growth is inhibited in high temperatures. Only a few strawberry cultivars survive temperatures over 100°F, even with 50% shade all day. Most strawberry cultivars will not set fruit over 80°F although some will flower in higher temperatures and set fruit when nighttime temperatures are below 80°F. In hot climates, strawberries do best when planted in the fall and harvested in the spring. USDA hardiness zones: 3-10, depending on cultivar. Flowers are damaged by temperatures below 28°F and should be protected by row covers. Strawberry flowers are white or pale red with five petals and a conical yellow center. They are self-fruitful and do not need another plant for pollination. The flowers bloom in spring for all types and also summer and fall for everbearing and day-neutral. Technically, the strawberry fruit is not a berry but an enlarged flower stem covered with seeds. The flesh is the stem holding the ovaries and the seeds are fruits. What we call fruit is a stem end with red skin and sweet red and white flesh. Some cultivars are all white. Strawberries will fruit 4-5 months after planting and will produce mature fruit 4-6 weeks after flowering. Pick berries when they are fully colored, without any pale areas on the outside. Wait until they are dark red if possible, and leave a bit of stem on the harvested berry. The flavor is best at dark red. Strawberries do not ripen further after picking. 'Loran' Ever-bearing, USDA zones 5-9, very tolerant of soil types, including neutral pH, low chill, long blooming, blooms late winter, spring and summer in USDA zone 8b, flowers and fruits in high temperatures. Annual. 'Quinault' Ever-bearing, USDA zones 4-9, highly disease resistant. Needs perfect soil conditions to flower. Perennial. 'Sequoia' June-bearing, USDA 4-9, tolerant of soil types, low chill, longer blooming, flowers and fruits in high temperatures. Perennial in USDA zones 4-8, treated as an annual elsewhere. Strawberry 'Loran' blooming and fruiting when the current afternoon temperature is 101°F and the morning temperature was 71°F. For hot desert climates, plant in late summer or early fall, not mid-winter. The roots will grow in the fall and blooming will begin in March or April for a spring harvest. Containers should be used without saucers so as to drain better without standing water in the bottom. Containers should not receive direct sun on their sides to avoid overheating roots. Hanging baskets can be used providing the soil does not dry out. Raised garden beds provide better moisture control than flat beds. Some dedicated gardeners use greenhouses with automatic misting to control high temperatures. Use well drained, high organic soil with a pH of 5.6-6.5 (acidic to slightly acidic). Do not use ordinary desert soil as part of the soil mixture. Premium potting soil with moisture retention works well. The soil should be kept moist. Not required if soil is properly prepared. Place root crowns at, or very slightly above, soil level. Root crown level is important – too high and the plant will dry out. Too low and root rot will occur. Avoid planting strawberries in soil where nightshades (tomato, pepper, eggplant, etc), melons, okra, mint, blackberries, raspberries and other bramble berries, stone fruits, chrysanthemums, and roses or other strawberry plants were growing less than five years earlier. This will prevent sharing common diseases such as Verticillium Wilt which can linger in soils for many years. While daytime temperatures are routinely over 90°F, strawberry plants must be shielded all day with 50% shade cloth and/or lattice. From Nov 22 to Mar 21, strawberries can be unshaded. The rest of the year, afternoon shade is needed. With drip irrigation, 1 to 1.5 mil plastic can be placed under and around plants to keep berries clean and reduce moisture loss during warm months. If using straw as mulch, take care not to cover leaves. Straw should not be used as frost protection. Row covers will protect plants from freezing temperatures and provide more sunlight during the day. Daily in the morning. Pale green leaves indicate overwatering. Small, misshapen berries signify underwatering. Twice a day at the same times will be necessary when temperatures are over 95°F. In the shortest days of the year, from the first of December to mid-January, watering can be reduced to every other day. Strawberry plants spread themselves by stolons called runners, above-ground roots with nodes that grow new roots into the soil at intervals to produce daughter plants (clones). Cut off all runners to keep the plant's energy devoted to developing roots, leaves and fruit, unless you want more strawberry plants. Remove weeds by hand to avoid cutting shallow roots. Remove dead or dying leaves and stems, as they appear, to avoid fungal diseases. Home gardeners can grow strawberries in long, narrow containers, then simply replace the soil and sterilize the containers every 2 years. In raised garden beds, strawberries should be grown for only two years, then replaced with other crops for five years. Rotation is necessary to avoid the build-up of microbial diseases that attack strawberries. Nightshade family crops, like tomatoes or peppers, cannot be used in the rotation because they share some of the same diseases with strawberries. Strawberries are heavy feeders that deplete the soil of nutrients. In rotation years without strawberries, leguminous cover crops like field pea and clovers can be used to add nitrogen to the soil. In one experiment, mustard cover crops and broccoli crop residue were plowed into the soil, just before replanting strawberries, to reduce the possibility of Verticillium Wilt. This experiment showed a five year rotation could be achieved instead of the normal seven years. Birds, rodents, slugs and snails can be a problem. An enclosure of 1/2" wire mesh or bird netting on top may be necessary. Plants that help strawberries include legumes such as beans and alfalfa which put nitrogen into the soil, and plants that attract bees such as borage. Caraway is also considered beneficial because it attracts beneficial wasps. Trying different cultivars is the best way to see what grows well in your location with your garden setup. This can be caused by too much nitrogen in the soil. Do not use nitrogen-only or high nitrogen fertilizers. Some cultivars, such as Quinault, will fail to flower if the soil is not to their liking, even when other cultivars, like Loran or Sequoia, flower in abundance. The soil must be properly acidic, have the right balance of nitrogen, potassium and phosphorous, and not be depleted of nutrients. Flowers will not set fruit if temperatures are too high. For some temperature-sensitive cultivars, daytime temps over 80°F will stop setting fruit even when nighttime temperatures are much lower. For other cultivars, low nighttime temperatures will keep them setting fruit. Insufficient soil nutrients or insufficient water may cause small fruit. Know what the normal size of the berries on your cultivar of plant are supposed to be. Insufficient water caused by (1) temperatures over 85-90°F and failure to water twice a day, or (2) plants possibly too close together and competing for water. Use a mite predator, such as Phytoseiulus persimilis, which can be purchased at garden supply companies specializing in organic controls. Sometimes older leaves on a strawberry plant will die, and they turn yellow and red in the process because they contain red pigment. Remove dead and dying leaves as soon as possible to prevent fungal problems. Red Stele root rot can also cause yellow or red leaves. This fungal disease is caused by poorly draining soil or overly wet soil. If your garden bed drains well, yellow and red leaves are usually normal. Red stems can be a characteristic of some cultivars and are not a problem by themselves. Verticillium Wilt is a root and crown disease that causes browning along the margins and veins of a leaf. Do not allow soil to dry completely, and do not place plants where this disease might be present. Remove dying leaves as soon as possible.